Sun., June 12, 2016, 5:34 p.m.
PARIS – UEFA opened disciplinary proceedings against Russia on Sunday for crowd disturbances and racist behavior by its fans during a European Championship game against England. The governing body of European soccer also said it would strengthen security at stadiums in France in response to the disorder. The English Football Association, whose fans fled the stadium in Marseille after being attacked by a large group of Russian fans, has not been charged by UEFA. 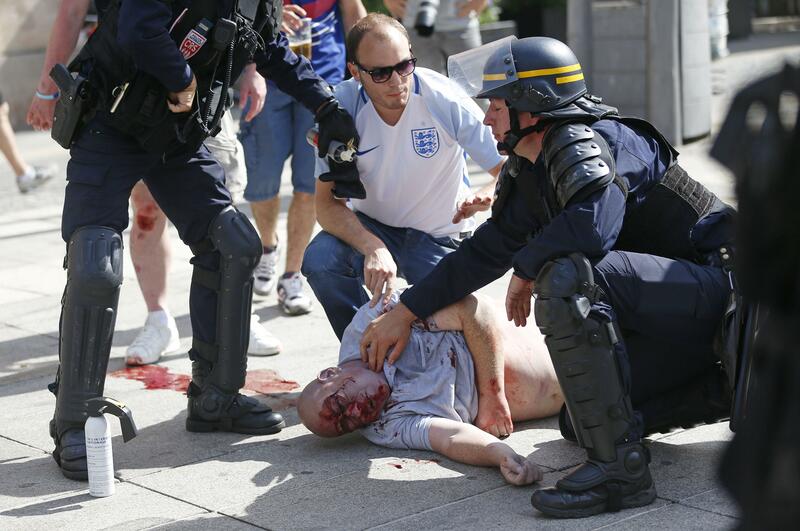 The high-profile scenes of unrest, both inside and outside the Stade Velodrome, marred the second day of the tournament, with UEFA expressing its “utter disgust” over clashes between Russian and English fans in Marseille. UEFA held emergency meetings on Sunday to reassess security measures inside the 10 stadiums being used across France for the 24-team tournament. “UEFA acknowledges that there were segregation issues at Stade Velodrome and will implement corrective measures to strengthen the deployment of security personnel at stadiums, in close collaboration with local authorities,” UEFA said in a statement. Russia has also been charged over fireworks being set off inside the stadium, where the game finished 1-1. UEFA said its control, ethics and disciplinary body will judge the case on Tuesday, imposing sanctions ahead of its second Euro 2016 game against Slovakia on Wednesday in Lille. UEFA is only taking disciplinary action over the disorder inside the stadium in Marseille, where it spread after three straight days of fighting near the port in the Mediterranean city. Although UEFA holds national federations responsible for their fans’ behavior inside stadiums, it typically does not act on incidents elsewhere. When UEFA’s disciplinary panel judges incidents in Marseille, it could take Russian fans’ track record at Euro 2012 into account. UEFA imposed a series of sanctions, including fines, on the Russian Football Union for incidents at that tournament, which was hosted by Poland and Ukraine. “A decision on the sanctions to be imposed will be made within the next few days, once the RFU has been able to submit written statements and evidence,” UEFA said. Saturday’s game was Russia’s first to be organized by UEFA since the lifting of probationary sanctions that were threatened after violent disorder by its fans in Poland four years ago. Among the incidents at Euro 2012, stadium security staff in Wroclaw, Poland, were assaulted by Russian fans in Russia’s opening 4-1 victory over the Czech Republic. The Russian authorities were fined 30,000 euros ($37,500) for racially insulting Czech Republic defender Theodor Gebre Selassie, who is black. In a separate Euro 2012 incident, UEFA charged and fined Russia for a fan carrying a national flag across the field after a 1-1 draw against Poland. That heavily policed match in Warsaw was played on June 12 – Russia’s national holiday – after fights in the city as rival fans went to the stadium. Published: June 12, 2016, 5:34 p.m.